Global Business Program majors, faculty, alumni, and advisory board members gathered on the evening of January 29 for the Ninth Annual Global Business Dinner at the University of Redlands to celebrate of U of R’s Global Business Department and its students. As a student and scholarship recipient in the Global Business Program, I especially appreciated the way the evening underlined the many opportunities the program has to offer its students. The Schroeder Global Business Summer Language Scholarship, made possible by Jim’65 and Althea Schroeder, lets Global Business majors study foreign languages intensively abroad. This year’s recipients, who will be studying this summer in Germany, Spain, Argentina, France, and China, are: Kirk McCreary ’20, Hunter Adamo ’20, Yuli Zheng ’19, Rachel Wilkin ’20, Jessica Marshall ’20, Mara Sherline ’20, Anh Do ’21, Giselle Martinez ’20, and Megan Houston ’20. The Hanson Summer Service Scholarship, made possible by Dan’75 and Durene ’75 Hanson, will support four students who will travel to Rwanda, South Africa, Colombia, and Thailand in 2018. The Summer Harris Scholarship for Marketing and/or Fashion, established in May 2017 by Rob Harris, founder and president of Pacific Market International, made it possible for Bryce Wilson ’19 to attend the Panamanian Kalu Yala Institute last summer and will support five students in the summer of 2018. The Finance Award, established last year by an anonymous donor, enables three freshmen or sophomore Global Business students to spend nine weeks studying finance intensively at the London School of Economics. In 2017, then-freshmen Elvis Begić ’20, Giselle Martinez ’20, and I received the scholarship, which will support sophomores Hunter Adamo ’20, Kirk McCreary ’20, and Sarah Taquet ’20 in studies in London this year. A Global Business Learning Lab grant, made possible by Jobar International, Inc., was awarded to Dakota Hughes ’18 and Kiana Molitor ’18. Through the Jordan A. Korinke Memorial Endowment for Experiential Learning, made possible by Kim Stafford Korinke ’00 and Ryan Korinke, Giselle Martinez ’20 is the inaugural recipient of this award, internship and opportunity for practical learning experiences. You can see why I believed a global business major would help me explore the world and expand my education, both inside and outside the classroom. 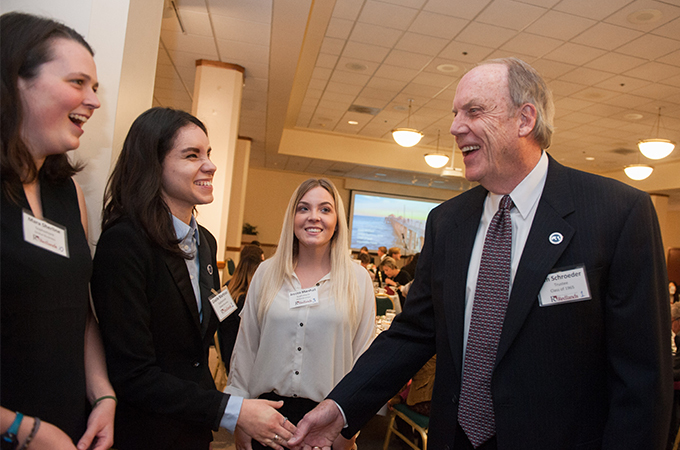 In addition to scholarships, opportunities for Global Business students are provided by the Wilke Career Pathways Program, endowed by U of R Trustee and Global Business Advisory Board member Chuck Wilke ’64, in which students network with the program’s alumni in diverse fields. Dozens of donors also contribute to a Global Business Student Success fund, which also supports the program’s students in a variety of engaging ways throughout the year. Global Business alumnus Reed McCord ’13, the evening’s keynote speaker, illustrated how U of R’s programs can have an enormous impact. After his sophomore year at the University, McCord traveled to Nicaragua as a Hanson Summer Service Scholar to assist Circulo de Amigas, a local foundation committed to helping young girls gain access to education and alleviating poverty in Nicaragua. Following his graduation, he began his career at a startup now known as Impossible Foods, where he is now chief of staff. I am proud to be part of the Global Business program, because its professors, scholarships, donors, and resources support its students’ drive to succeed and ultimately make an impact in their work and world.